Late yesterday evening we took a flight into Beauvais-Tillé Airport, a budget facility located some fifty kilometres to the north of Paris, where we hired a car and promptly began driving south. Our route took us past Charles de Gaulle Airport, where we'd been only a few days before, and onwards to an overnight hotel outside of the city that we reached shortly after midnight. In an ideal world we'd have had an earlier night, but arranged that would have necessitated a circumnavigation of the Boulevard Périphérique at rush hour the next morning, a not entirely enticing prospect that we ruled out in emphatic fashion using some interesting colourful metaphors. Our day began at Family Park, a children's park located in the picturesque village of Saint-Martin-le-Beau located just outside the city of Tours. There was a short queue to buy tickets when we arrived, but it moved quickly and we were soon relieved of twelve euro apiece, which we added onto almost twenty euro in road tolls and a similar amount in diesel. The already tenuous value proposition for the morning was reduced further as both the Cinéma 7D and the Grande Roue were out of service, representing a sizeable percentage of the attractions suitable for adults. Having said that, our main target was the roller coaster, which (fortunately) was operational. Seven years ago I rode my one hundredth different Wacky Worm, earning a pathetic coaster enthusiast milestone and worthless bragging rights. At the time I had no expectation of being able to double that figure, given how many examples of the genre are off limits to adults, but today Family Coaster (#2354) became number two hundred. The operator would not allow us to sit in the back row of the SBF-built train, as the restraint in it had failed at some point in the past, but we were able to squeeze into the front section of the same car without too much difficulty. From that location there was a slight pop of airtime on the main drop; aside from that our three laps were pretty much entirely as expected. Enthusiasts retracing our footsteps should be aware that all rides with operators at Family Park are closed for a one hour lunch break at 12:30pm. Today this worked in our favour, as we were able to snap plenty of unencumbered photographs as the guests headed to the park restaurant. In the early part of this millennium the French manufacturer Soquet produced a large number of family coasters for parks all over France. Though their installations were without exception excellent the market began to reach saturation point after several good years, resulting in a decision to pivot into water rides and cycle railways. In June 2014 I'd completed all but one of their operating coasters, and decided it was worth driving several hours into the middle of nowhere in order to complete the set safe in the knowledge that there (probably) wouldn't be more in the near future. The Chenille Fantastique wasn't a massively exciting ride, but this was perhaps forgivable given that the hardware dated from 1981. Nobody could have predicted that Soquet's triumphant return to coaster manufacturing after a seven year hiatus would be with an installation at that same remote park, its awkward location reemphasised by the fact that just two enthusiasts had ticked off the new ride a full twelve months after its premiere. Cacahuète Express occupies broadly the same footprint as its predecessor, but is otherwise a completely different experience. The new track is more than three times the length of the original, and features a variety of hills and drops along its route. The ride is still very much in the family category, with one exception; a powerful airtime-laden turn at the end of the layout that is a definite highlight for those sitting at the front of the train, the sensations boosted considerably by a fixed position lap bar that allows freedom of movement (even to those who've decided to invoke article fifty). Sadly the experience at the back of the train isn't in the same league; there is a definite sideways shuffle there that isn't found on other Soquet rides, resulting in some decidedly jarring transitions. That, coupled with the small of burning rubber in the station, suggests rather strongly that Peanut Express may need some refactoring in the years ahead. Our itinerary had us driving directly from Parc Fenestre to an overnight hotel in Brive-la-Gaillarde, a distance that would have taken roughly ninety minutes to cover. We would have had ample time for a relaxed evening meal followed by an early night, which would have left us with a lot more energy for the remainder of our trip. However, in defiance of all logic and reason I decided that we'd fit in a side trip to the Luna Parks near Agde, adding roughly eight hours of driving to an already lengthy day. It goes without saying that this was an exceptionally stupid thing to do, and the only slight mitigation I can offer for the insanity was my desire to get Megan nine bonus credits. She was not in favour of the idea and made a valiant but fundamentally unsuccessful attempt to talk me out of it. It was still light when we arrived at the first of our three parks. During the drive we'd made the decision to get in and out of each stop as quickly as possible, and thus we began a brisk walk around the grounds in search of coasters. Our first hit ended up being the Big Apple (#2355) that I'd just missed on my last visit to the area almost a decade before. There wasn't enough space for us to ride together, so Megan headed for the car in front of mine. Her restraint was jammed in the shut position, but this presented no problem as there was more than enough room for her to shoehorn herself into place. The ride experience was unremarkable, with three completely standard laps. Our second hit was Roller Coaster, a SDC Galaxi that has made an annual appearance on the northern boundary of the park for many years. The ride was running very well this evening, delivering airtime on the drops and pleasant forces in the descending helices. We followed this with Wilde Maus, a fine looking machine that sadly failed to live up to its appearance. The first portion of the layout was good, but all the trim brakes were in use after the first big drop, rendering the overall experience flaccid. The one positive for me was the fact that this wasn't a Reverchon/Zamperla model thus giving it at least a modicum of novelty. Lunapark Cap d'Agde was much busier than nearby Lunapark Marseillan-Plage, to the point that the dedicated car park was almost completely full when we arrived shortly after nine. We laid claim to one of the last available spots and walked through the eastern park gate next to the flume and an extant but faded sign for Toon's Land, a children's park that disappeared underneath its larger neighbour at the end of the 2007 season. The main attraction for us tonight was Apocalypse, a Vekoma Corkscrew with Bayerncurve that spent twenty-nine years at Flamingoland in England where it was actively rough. Many enthusiasts including this one expected it to be scrapped, but instead it has been comprehensively restored and upgraded with a new lighting and theming package that looks very good indeed. The ride quality still leaves a little bit to be desired, but from our front row seat the bumps were manageable enough. The exit pathway took us past the open door of the ride machine room, and we couldn't resist taking a quick peek (though to be fair there really wasn't a whole lot to see). We were rather more taken with Roller Coaster, which tonight appeared to have been retrofitted with an invisible yet effective boost mechanism. Nothing else could explain how the cars were racing around the track at a speed previously unheard of on a ride of this type. The forces throughout the course were measurably stronger than the norm, culminating in a hill before the last turn that delivered several seconds of floating airtime. 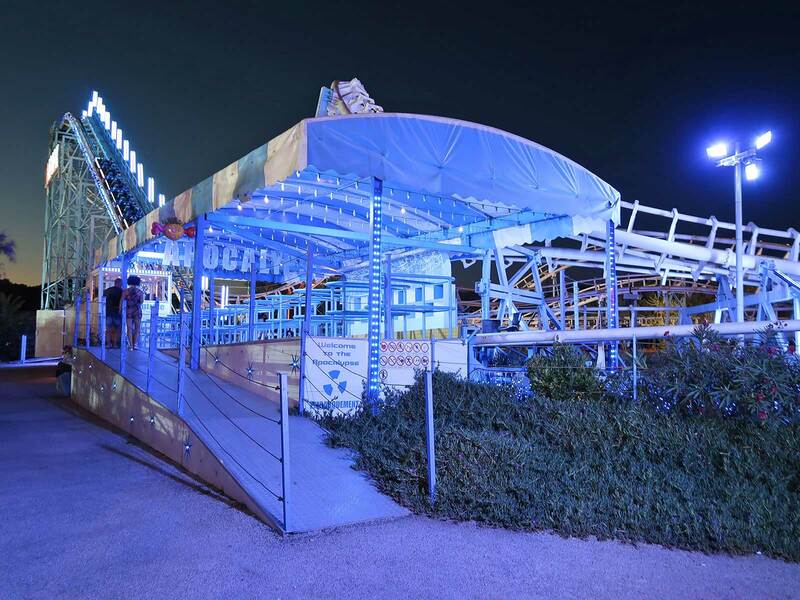 The ride was a complete revelation, demonstrating that Galaxis can be upper echelon coasters, and making us wistfully contemplate the limitations of the hundreds of other similar installations worldwide. With that done we headed for Speedy, a standard layout Wacky Worm with an elaborate mural underneath the lift and sound effects on top of a Mariachi remix of Gangnam Style that was quite simply bizarre. One of these days I'd like to hire an amusement ride for a few hours and swap out the usual soundtracks for sixteenth century Anglican church music, perhaps something like Spem in alium; it'd be worth the expense just to see people's reactions. In a rare (and somewhat overdue) moment of sanity we decided not to call into nearby Pirat Parc, making Europark the last stop of the evening. 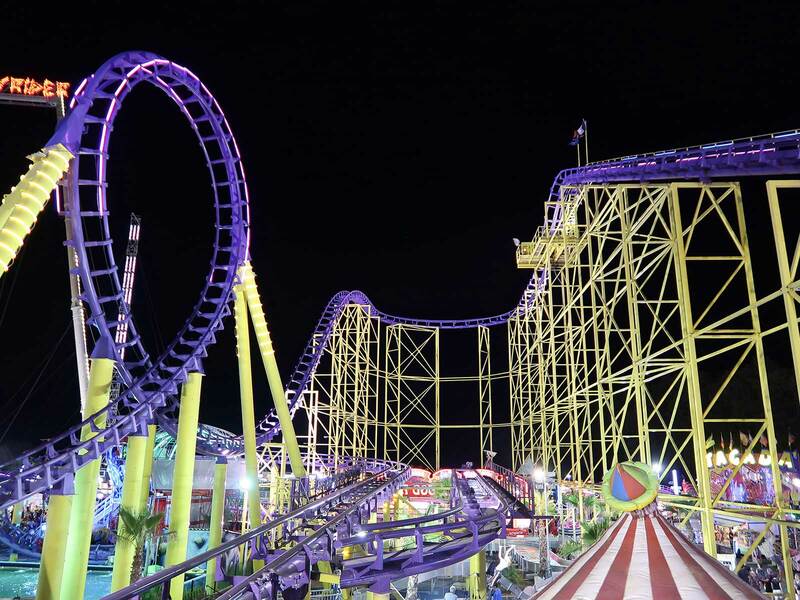 The place is by some margin the largest of the summer funfairs on the French coast and the only one to have a whole range of permanently installed rides, including a flume, two coasters, a pair of S&S towers, and a Skycoaster. The various other attractions travel outside of the peak summer season, though it's worth noting that virtually all of them return to the same locations year on year. The net effect is an atmosphere similar to that of Wiener Prater; a high-class fairground with a wide variety of well presented attractions competing for guest euros. 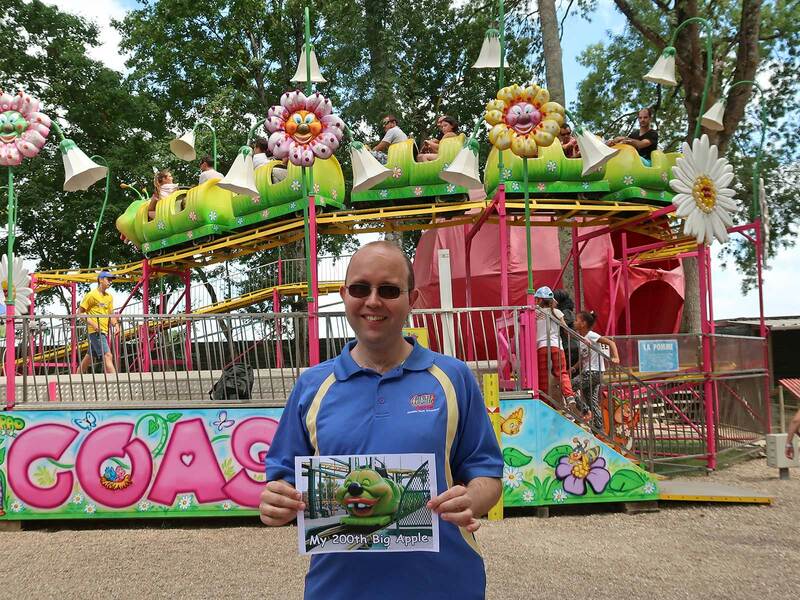 Bad Trip (#2356) is a spinning mouse coaster that is listed as a product of French company Cedeal Rides. However, a little bit of online research has revealed that the postal address for this company is actually a gated back road that runs directly behind the factory for Reverchon, suggesting rather strongly that the name was a poorly-disguised front to offer products from that company after it filed for bankruptcy in 2008. The original brand has rematerialised since, perhaps explaining why the Cedeal Rides Facebook page is no longer available. Regardless of its provenance, the ride wasn't one of the finer examples of the genre; the build quality fell short of the norm with quite a bit of shuddering along the route, though on the plus side we did at least enjoy plenty of spinning. The signature coaster at the park is Euroloop, a Vekoma Double Loop Corkscrew and a clone of both Python and Shaman. 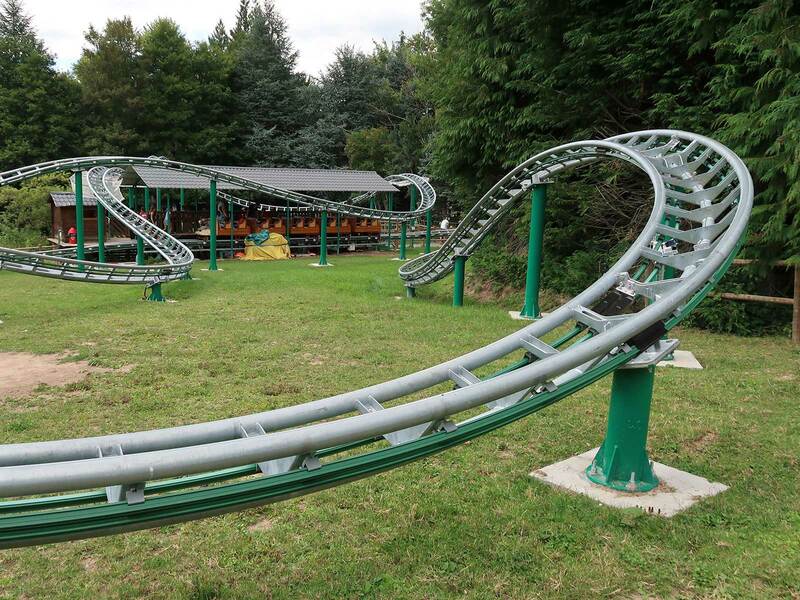 The hardware was originally installed at Mirapolis, an ambitious theme park located in north-west Paris that closed in 1991 after just four seasons. It was subsequently relocated to Spreepark which also failed, its owner subsequently ending up in a Peruvian prison for drug smuggling. Today the ride has been fully integrated into its new home, with almost all of the track located above the main midway. Tickets were €5, and as all riders were given two laps of the course, though unlike in previous years there was a pause between circuits to make sure everyone on board was okay to ride a second time. We were happy to continue as the ride was enjoyable enough despite the usual complement of bumps. Our third stop was at Eurospeed, a Mack creation that has held the record of the world's longest powered coaster since it was first installed as Rothaarblitz at Germany's Panorama Park in 1982. It was refurbished and relocated to France in 2009, where it gained a series of elaborate stone archways for theming. The course was quite lengthy, and much of it was negotiated at full speed making for a forceful ride, though it'd be remiss of me not to record that a few of the transitions lacked the refinement of later Mack products. There was a tunnel towards the end of the course which smelled like a Chinese bathroom, though fortunately we were through it quickly enough and knew to hold our noses on our second lap. We met up very briefly with our friends Bruno and Anita at the Pomme, a standard ride with a very non-standard rubber tube restraint that clearly wasn't designed with larger individuals in mind. Megan and I had to sit in separate cars as I had to sit sideways in order to fit. With our ride complete we chatted for a few minutes before heading to the car for our long drive north.